The Paramecium genus contains numerous species of single-celled microscopic organisms that appear much like a lady's slipper surrounded by tiny hair-like appendages termed cilia. The miniature protozoan glides through water by a coordinated movement of its cilia like millions of miniature oars. 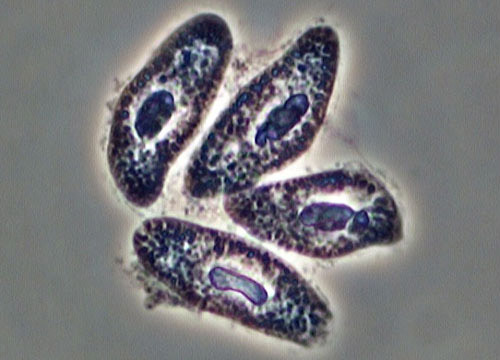 Paramecia are generally found in slow moving and still bodies of freshwater, especially in areas containing large amounts of pond scum, which is rich in algae. Over 75,000 individual species of paramecia have been recorded and all share certain common features. Constantly moving in search of food, a paramecium sweeps up its meals, mainly bacteria and other small organisms, with a series of cilia that line its oral groove and gullet. 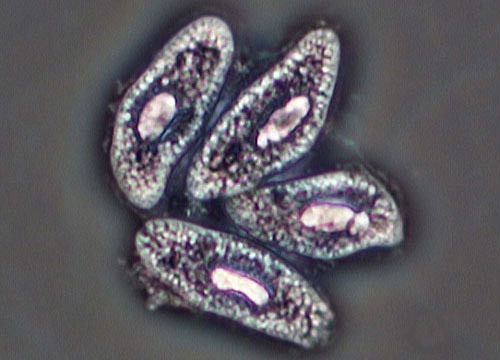 A single paramecium has three nuclei. A large, macronucleus is essential for its survival, while one or two smaller micronuclei are necessary for sexual reproduction. Reproduction is usually asexual by binary fission and can occur several times a day. Occasionally, two organisms will exchange nuclear material through conjugation, a form of sexual reproduction. Although quick to reproduce, a paramecium cannot always successfully compete with its most extraordinary predator. Didinium is smaller in size, but exhibits a ravenous appetite for paramecia. Also classified as protozoa, most species of Didinium are barrel shaped, surrounded by cilia, and have a sharp horn with which they attack and maneuver the prey. After forcing a paramecium into a position in line with its mouth, Didinium opens wide in order to swallow its meal whole. The tiny creature can ingest a paramecium twice its size and repeat the feat as many as a dozen times a day. A group of didinia can rapidly annihilate a large colony of paramecia.